Alban William Housego ‘Bill” Phillips; Image used with permission from the London School of Economics. 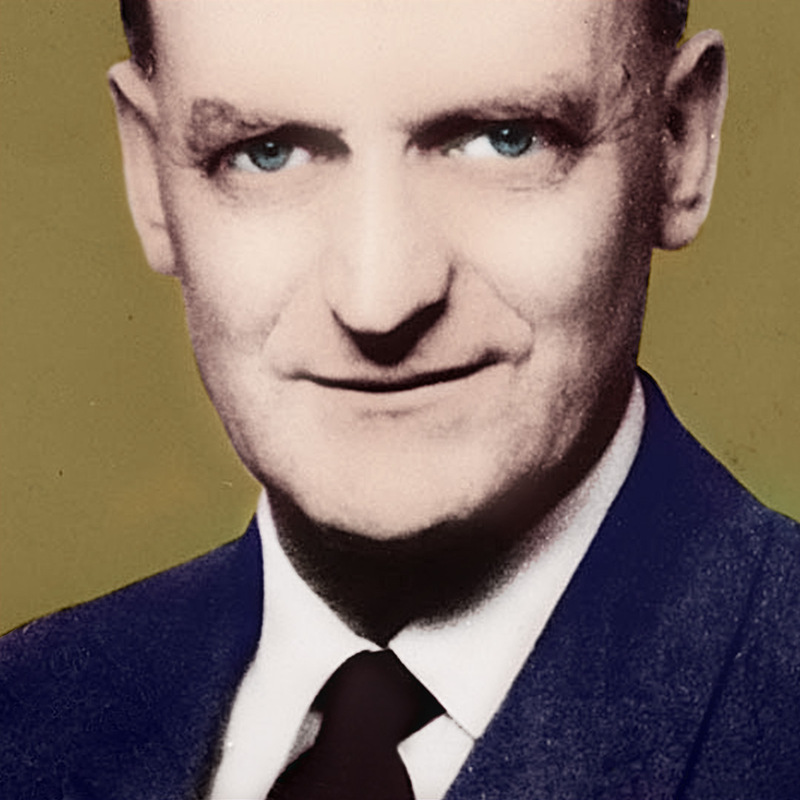 Economics has a reputation for being a boring topic but the life and career of New Zealand born economist A W H Phillips was anything but boring. Engineer, crocodile hunter, innovator and war hero; Phillips traversed an unconventional path to become one of the most influential economists of all time. Such was his influence on modern economics, most major textbooks have a portion devoted to the concept named in his honour – the Phillips Curve. His paper on wage inflation and unemployment is the most cited macroeconomics title of the 20th Century and his pioneering work in the field of applied macroeconomics continues to influence modern economic policy. Alban William Housego Phillips was born on the 18th of November 1914 at Te Rehunga – a small farming community near the town of Dannevirke, New Zealand (and just over 40 miles from Pongaroa where Nobel Prize winning physicist and molecular biologist Maurice Wilkins was born in 1916). 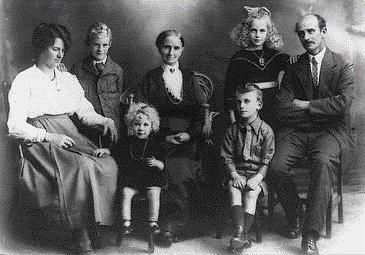 More commonly known as Bill, he was the second youngest of six children born to Harold and Edith Phillips. His father was a notable Jersey cow breeder and his mother was a teacher at the local primary school. They lived in a modest home which was built by Harold and extended periodically to accommodate subsequent generations of family. As noted by Bill’s younger sister Carol, the Phillips household was “well rounded” – a quality cultivated by their father’s resourcefulness. Harold Phillips also built a flush-toilet, a number of dams and a fairly sophisticated electrical system which was powered by a homemade waterwheel. The latter provided electricity for lighting as well as for the family’s American-made washing machine, the first of its type in the community. These innovations were undertaken at a time when there was no electricity or flush toilets in the region and when travel was still being undertaken by horse and cart. Indeed, the Phillips children travelled to school every day on the back of a milk cart and then had to endure an arduous, one hour bike ride along a jagged shingle road. The Phillips Family. Bill is seated in the front row to the right of his father, Harold Phillips. Image used with permission from the niece of A.W.H Phillips. The pick-up truck and electrical lighting were not his only childhood innovations. He and his brother developed a keen interest in photography, which led to them setting up their own darkroom and dabbling in a crude form of cinematography. They also became interested in transistor radios at a time when electrical technology was still in its infancy. They built a number of radios and Bill was able to hone his ability as a technician – a skill that he would later make good use of during the war. Having graduated from Dannevirke High School at age fifteen but too young and impoverished to enter university, Bill made good use of his childhood passions. He took up an electrical apprenticeship at the Tuai hydro-electric station in the Hawkes Bay and subsidised his meagre income by establishing the community’s first cinema. According to his sister Carol, cinematography almost became his fulltime career. 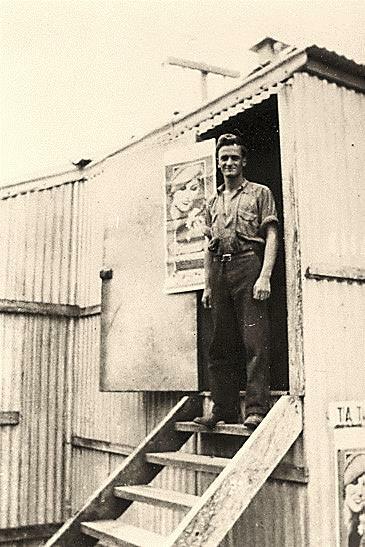 Its popularity spread to other rural communities, resulting in the setting up of two more cinemas which Bill travelled between by motorbike, all the while maintaining his apprenticeship at Tuai. 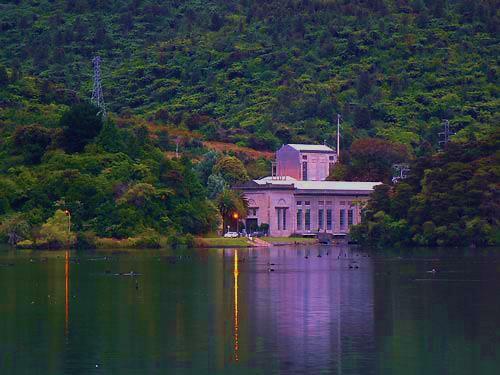 The Tuai Hydro-electric station on Lake Waikaremoana, Hawkes Bay © Phil Rickerby. Bill left Tuai in 1935 and embarked on what is often considered a rite of passage by many young New Zealanders. The Big O.E or Overseas Experience nearly always started in Australia and so it did for Bill Phillips. With little more than a knapsack on his back and a few dollars in his pocket, he spent the next two years travelling across Australia doing a variety of jobs including electrical work, cinematography, crocodile hunting and gold mining. This was just the first part of a ten year journey that would not only test his resourcefulness but also his will to live. 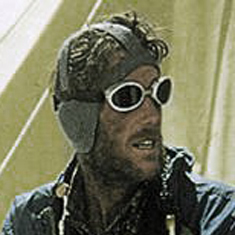 The young Bill Phillips, prior to leaving New Zealand for Australia. Image used with permission from the niece of A.W.H Phillips. Struck by wanderlust and a desire to work in Russia, Bill left Australia in 1937 on a Japanese vessel bound for China. His plan was to get a mining job in Russia and gradually work his way to Britain. But just a few days into the voyage, Japan declared war on China and the vessel he was travelling on was diverted to Tokyo. 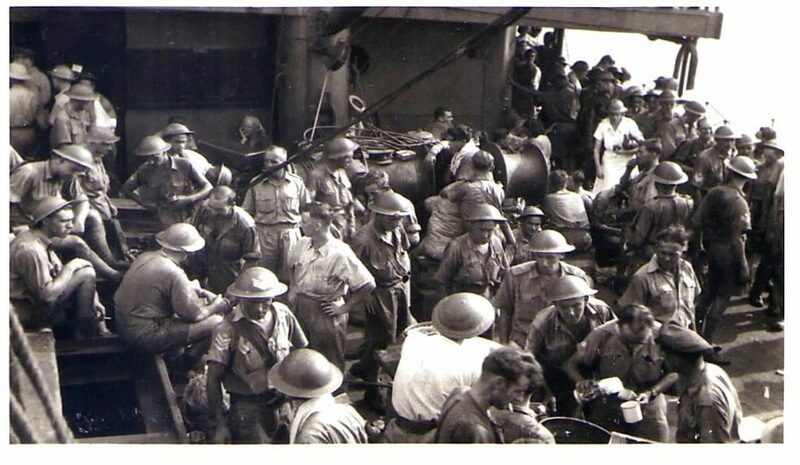 Unaware that the Japanese were about to wage war in the Pacific, Bill unwittingly drew attention to himself by snapping photos of Japanese soldiers on parade. He was subsequently arrested in Horrishma where he was interrogated and accused of being a foreign spy. How he managed to wriggle out of this dilemma is unknown but according to a friend, “he got off lightly” and eventually made it to Russia via the Trans-Siberian Railway. Bill’s plan to find a mining job in Russia also proved futile due to what he described as “a plentiful supply of political prisoners”. So the young New Zealander proceeded to London where he took up board with a Russian couple. Prior to leaving Australia he had been studying electrical engineering by correspondence and on arriving in London he was able to take up work in this field. Little is known about his time in London, other than he took up part-time study and also became a fluent speaker of Russian courtesy of the Russian couple. Bill had spent little more than a year in London when World War Two broke out and having already acquired a taste for adventure, he wasted no time in volunteering his services to the Royal Air Force. It was therefore with some irony that they sent him back around the world to Singapore, where he was appointed Flying Officer to 243 Squadron. 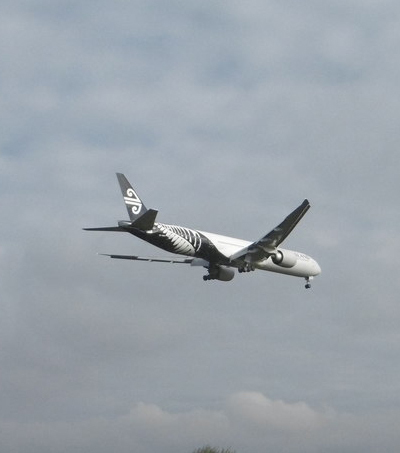 However, Bill also worked closely with New Zealand Airforce Squadrons 283 and 488. It is an understatement to say that these squadrons had been slapped together at the last minute. 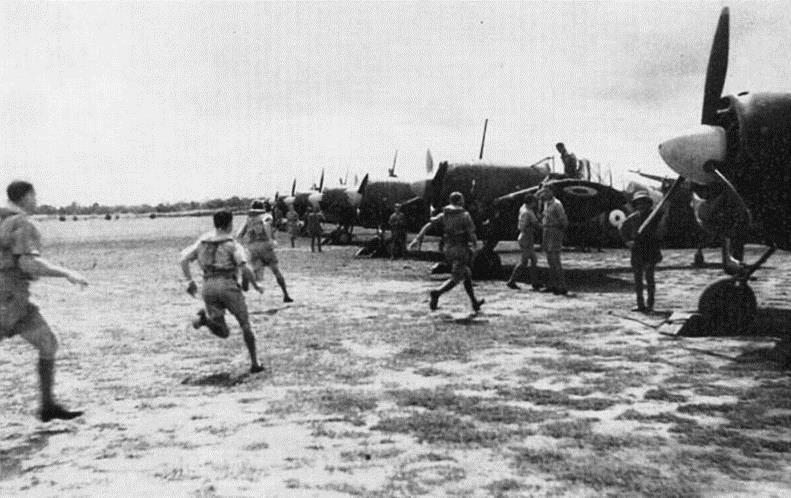 They were tasked with defending Singapore against a Japanese invasion but the American-made planes they had inherited were in very poor condition. New Zealand Air Force pilots of No. 488 Squadron (Singapore 1942) scramble to get their American-made fighter planes airborne ©www.nzetc.victoria.ac.nz. This image has been reproduced with the permission of the Ministry for Culture and Heritage. “One day Bill and boat-working friend were returning to camp and saw their camp-minding friend’s head come into view. They promptly called to him, only to be dismayed by seeing a shorter Japanese figure on either side of him… they turned, and made a mad dash towards and over a sea cliff. This he picturised as a Walt Disney Character with his feet still running as he fell. The two men stayed at large a few days longer but eventually had to concede defeat and became prisoners. 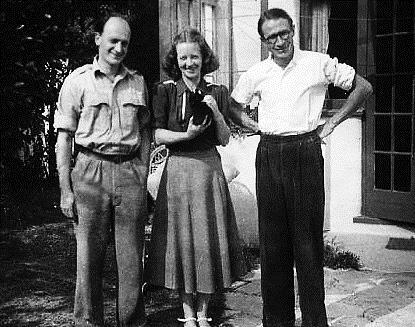 Bill was repatriated with his family in New Zealand following Japan’s defeat but according to his sister Carol, “he was woefully thin” and quite unwell. He barely weighed forty-five kilos; was unable to eat an average sized meal; and had a permanent tremor which was particularly noticeable as he chain-smoked one cigarette after the next. Despite his poor health, Bill decided to take up an offer given to many former Commonwealth servicemen in those days – an opportunity to study at a British university. It is said that Bill’s wartime experiences had cultivated in him an interest in human behaviour and in the winter of 1946 he began a degree in sociology at the London School of Economics. A good knowledge of economics was needed in order to study sociology in those days and by 1948, the last year of his undergraduate degree, he had developed a keen interest in it. 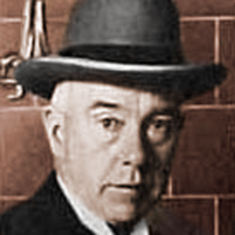 Economics at the time was dominated by Keynesian theory – government intervention and fiscal policies designed to control the ebb and flow of money in the economy. It would seem absurd that a student who had barely finished his undergraduate degree could come up with a way of modelling such an economy, but that was exactly what Bill did. In the last year of his undergraduate degree, Bill wrote an economics paper entitled “Saving and Investment: Rate of Interest and Level of Income”. Despite his best efforts he could not get anyone at the London School of Economics to read it. So he showed it to a friend, Walter Newlyn, who had recently been appointed to a position in economics at Leeds University. By his own admission, Newlyn read very little of the paper but was struck by a diagram Bill had drawn. The diagram showed the workings of the British economy but it was presented in a way that was akin to a modern computer model. Of course, there were no computers capable of modelling an economy in the nineteen forties, but that did not stop Bill from building one. With Newlyn’s help and funding from Leeds University, Bill created the world’s first computer-model of a country’s economy. 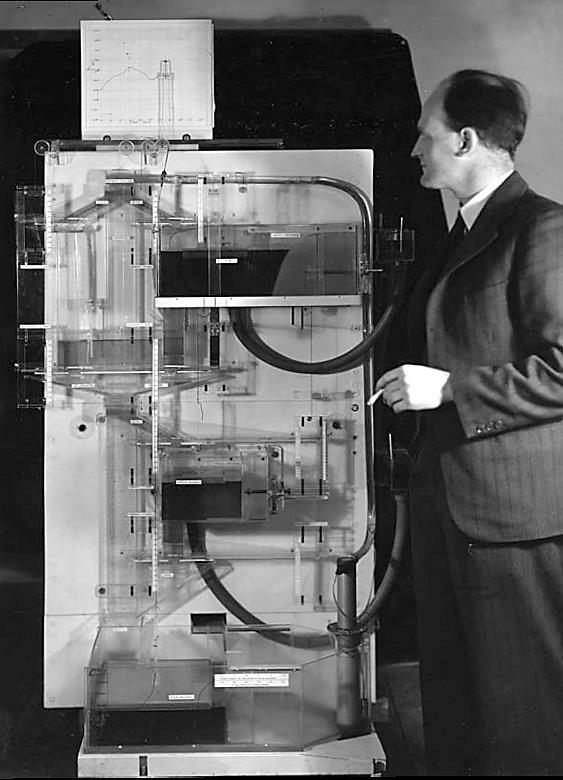 The Monetary National Income Analogue Computer or MONIAC, as it came to be called, was not so much precursor to the digital computer but a reflection of Bill’s creative genius. In the absence of electronics and sophisticated graphics, Bill used hydraulics and coloured water. The water was pumped via transparent pipes in and out of reservoirs labelled “imports”, “exports”, “taxes”, “spending”, “savings” and ”investments”, thus depicting the circulation of money in the economy. A.W.H “Bill” Phillips demonstrating his Monetary National Income Analogue Computer (MONIAC). Image used with permission from the London School of Economics. Despite being a hydraulic computer, the MONIAC had some astonishing digital computer qualities. The flow of money-water through its reservoirs could be manipulated to simulate the effect of changes in economic inputs and outputs – income, consumption, taxes and expenditure. Additionally, there were two scrolls of paper at the top of the machine connected to floats that could trace lines up and down like a seismograph, thus recording the ebb and flow of economic activity in real time. In his book “Undercover Economist Strikes Back,” Tim Harford notes that the machine could solve nine differential equations simultaneously and that it would be years before digital computers could support models as complex as the MONIAC’s. Bill was invited to demonstrate his machine at the London School of Economics Robins Seminar in 1949. It is said that the professors attending this seminar were sceptical and somewhat dismissive of Bill’s academic credentials. However, their snobbery soon gave way to astonishment as pink water began carousing through the machine’s pipes and reservoirs. Smoke in hand and pacing incessantly, Bill simultaneously delivered a rousing lecture on Keynesian theory which left the professors speechless and his future career in no doubt. 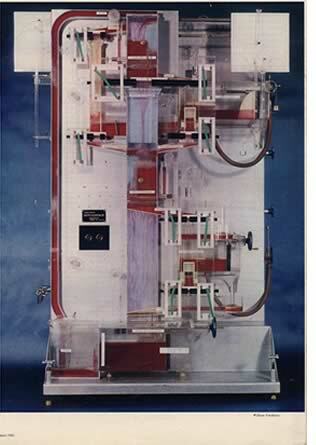 Not surprisingly, the MONIAC came to be known as the “Philips Machine” and Bill was subsequently elevated to the position of assistant lecturer following the publishing of a journal article on it in 1950. Articles about the machine also appeared in numerous magazines, including the American magazine “Fortune” in 1952 and the British satirical “Punch” in 1953. Such was its popularity, versions of the MONIAC were purchased by a diverse range of universities and organisations – Manchester, Harvard, Oxford and Cambridge Universities, the Ford Motor Company and the Reserve Bank of Guatemala to name a few. Predicting and measuring the likely effect of macroeconomic policy on key economic factors (econometrics) became a major part of Bill’s pioneering work. Economists at the time were restricted in what they could predict by a lack of mathematical models and formulas. Somewhat ingeniously, Bill circumvented this problem by adapting models and formulas borrowed from engineering. This adaptation was, as noted by Leeson; “a path breaking application of engineering… techniques to economic systems.” Understandably, Bill’s work did not escape the attention of his contemporaries in America, particularly Milton Friedman. Friedman and his colleagues at the Chicago School of Economics were grappling with similar prediction problems and in March 1952, he sought Bill’s advice on how to “approximate expectations about future inflation.” It is said that they were sitting on a park bench in the middle of London when Bill took an envelope from his pocket and scribbled down his adaptive expectations formula. Ironically, this formula would later be credited to Friedman and used to critique Bill’s better known contribution to economics – the Phillips Curve. Bill declined the offer but in 1960 Friedman tried to recruit him again. Once again Bill declined, pointing out that Chicago is; “a notable… centre of empirical research in economics” but perhaps not as theoretical as the London School. Friedman in his reply appeared to take exception; “Heaven preserve us if Chicago should not offer as hospitable an environment for theoretical as to empirical research and conversely”. Bill described it as “a wet weekend” in 1958 when he began comparing nearly one hundred years of British inflation and unemployment data. After plotting the data on a scatter graph, he was able to fit a curve to it which would later be named in his honour. 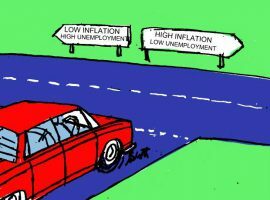 The curve showed an inverse relationship between inflation and unemployment. Bill was initially reluctant to present his findings but after some persuasion by colleagues, he wrote a paper which he entitled; “The Relation between Unemployment and the Rate of Change of Money Wage Rates in the United Kingdom, 1861 – 1957”. It is said that A.W.H “Bill” Phillips wrote his adaptive expectations formula (above) on an envelope for Milton Friedman, who then gave it to his doctoral student Phillip Cagan. Cagan still refers to is as “Phillip’s formula”. Picture © C. Williams. Ironically, the Phillips Curve was not discarded by Friedman and other monetarists. Rather, it was amended to take account of factors affecting the trade-off over longer periods of time. Often referred to as the “Short-Run Phillips Curve,” it now depicts the trade-off over a series of shorter time periods, thereby avoiding the long-term effects of inflationary expectations, external price shocks and sudden increases or decreases in the quantity of money. 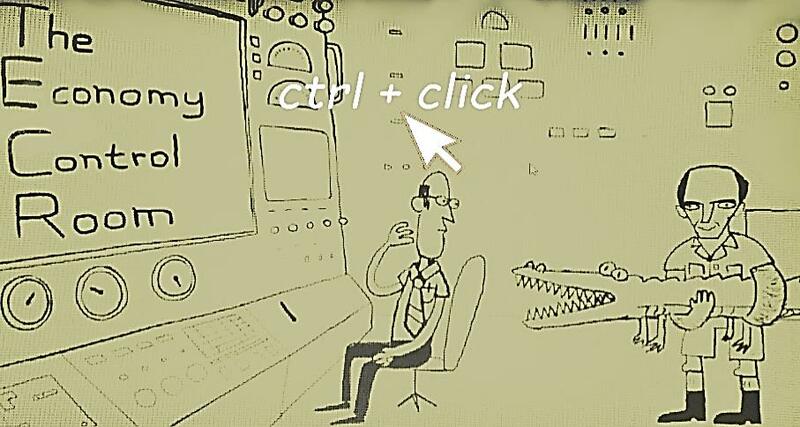 From all accounts, Bill had never taken much interest in the curve or the controversy surrounding its use. A contemporary of Bill’s noted that in keeping with his engineering background; “he wanted to know how systems worked [and was] not much interested in the scholarship of the subject – who had said what, and when.” It is little wonder then, that he did not assert his claim to the formula which was instrumental in changing the face of modern economics. Nor did he object to Friedman and others using it to advance their own interests. It was simply not in Bill’s nature to put himself above others or to seek academic kudos. It was while lecturing at the Australian National University that Bill suffered a debilitating stroke which abruptly ended his brilliant career. 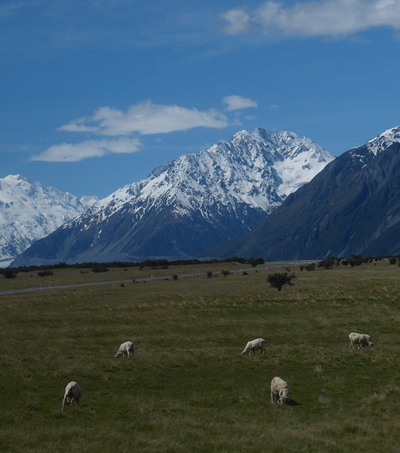 Bill and his family immediately moved back to New Zealand so that he could convalesce. However, against his doctor’s advice, he took up a part-time lectureship at Auckland University. On the fourth of March 1975, the day after his first lecture, Bill suffered another stroke and passed away. He was just sixty years of age. Like so many great people, Bill’s tenure in this world was short but impactful. 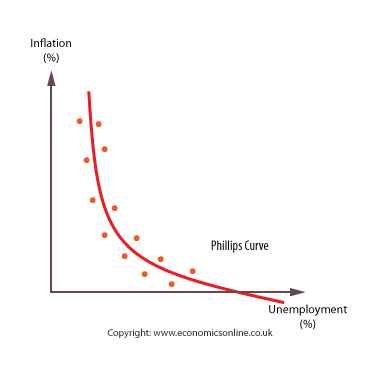 Most economists are aware of Bill Phillips and in particular, the famous or infamous curve named in his honour. But few people, including economists, are aware of the pioneering work that he undertook in the area of applied macroeconomics – the adaption of engineering models to economics; the advanced work he undertook in stabilisation policy and continuous time modelling; and of course his adaptive expectations formula which facilitated the monetarist counter revolution. 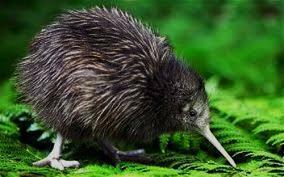 Another intelligent and undemonstrative New Zealander, quietly going about its business. The use of fiscal, monetary and macro-financial policy tools to stabilise world economies (monetarist economics). 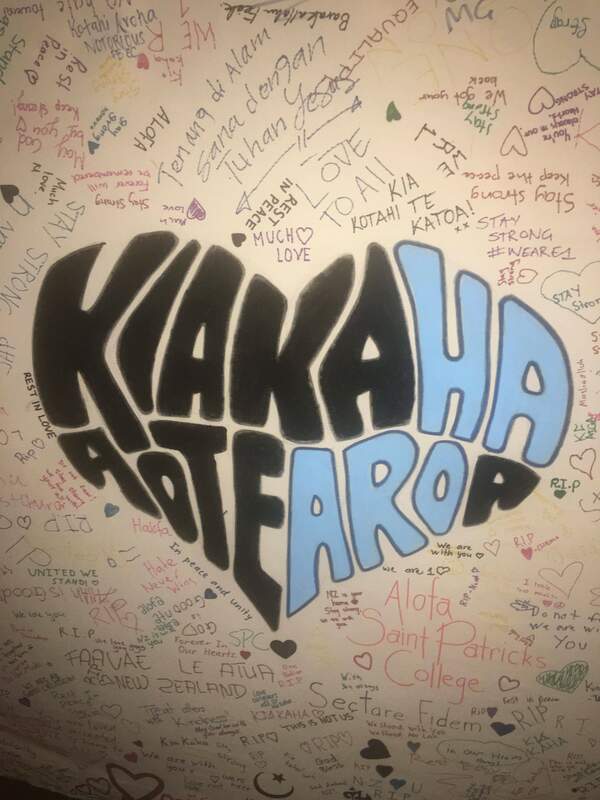 In many respects, the life and character of Bill Phillips mirrors the traditional archetypical figure tucked away in the national psyche of many New Zealanders. Bill epitomised pragmatism in that time-worn phrase the “number eight wire” mentality. He was courageous and intelligent but also humble and like the country’s national symbol, he shied away from the limelight, going about his business without any great fuss or fanfare. Economist Rex Bergstrom sums up Bill Phillips in the flowing extract and this story’s final tribute to a New Zealander of outstanding qualities whose ideas and innovations have had a lasting effect on the world. Friedman, M (1968). The Role of Monetary Policy. The American Economic Review. Volume LVIII March 1968 Number 1. Gosh, C & A (2011). Macroeconomics. Eastern Economy Edition. PHI Learning Ltd, New Delhi, India. Hall, T (1989). The Rotten Fruits of Economic Controls and the Rise from the Ashes, 1965-1989. University Press of America. Lanham, Bolder, New York, Toronto. Harford, T (2005). The undercover economist strikes back: how to run – or ruin – an economy. Little, Brown and Company. Boston MA. Ibbotson-Somerville, Carol (1994) As the Twig is Bent: Personal Thoughts, Memories and Reported Experiences of My Brother. Mimeo. Koenig, E. Leeson, R. Khan, G (2012). The Taylor Rule and the Transformation of Monetary Policy. Hoover Institution Press, Stanford University, Stanford California. Leeson, R (2000) A. W. H. Phillips: Collected Works in Contemporary Perspective. Cambridge University Press, Cambridge United Kingdom. Leeson, R. (1997). A. W. H. Phillips. In T. Cate (Ed), G. C. Harcourt, & D. C. Colander (Assoc Eds). An Encyclopaedia of Keynesian economics. Cheltenham, United Kingdom, Brookfield V.t: Edward Elgar. Leeson, R., & Young, W. (2008). Mythical expectations. In R. Leeson (Ed). The anti-Keynesian tradition. New York, NY: Palgrave Macmillan. Quiggin, John (2010) Zombie Economics: How Dead Ideas Still Walk among Us. Princeton University Press. 41 William Street, Princeton, New Jersey. Sleeman, A. G. (2011) Retrospectives: The Phillips Curve: A Rushed Job? Journal of Economic Perspectives. Volume 25, Number 1. Pages 223-238. Solow, R. Taylor, J. Mankiw, G (2009) Fifty Years of the Phillips Curve: A Dialogue on What We Have Learned. In Understanding Inflation and the Implications for Monetary Policy, Edited by Jeff Fuhrer, Yolanda K. Kodrzycki, Jane Sneddon Little and Giovanni P. Olivei. Published by MIT Press. Rivot, S (2013). Keynes and Friedman on Laissez-Faire and Planning: ‘Where to Draw the Line? Routledge Studies in the History of Economics. Routledge, Abingdon, Oxon. Born in Hastings New Zealand, Craig moved with his family to Sydney Australia when he was 13 years of age. He attended high school in Sydney and later began a colourful working career, firstly as a shipping agent and then as a private investigator for a small company in Sydney’s Eastern suburbs. His experiences as an investigator generated in him an interest in human behaviour, which led to him studying sociology and psychology at Victoria University in the 1990s. After graduating from Victoria with a BA, BSc (Hons) and MSc in psychology, he took up work in the field of psychology, specialising in the design, development and implementation of behaviour change programmes. Craig has also written Legends stories about the pioneering surgeons Harold Gillies and Archibald McIndoe, and guerilla warfare pioneer and legendary engineer Te Ruki Kawiti. A truly amazing story. Worthy of a screenplay and film one feels but so much to pack in so perhaps a TV mini-series instead. 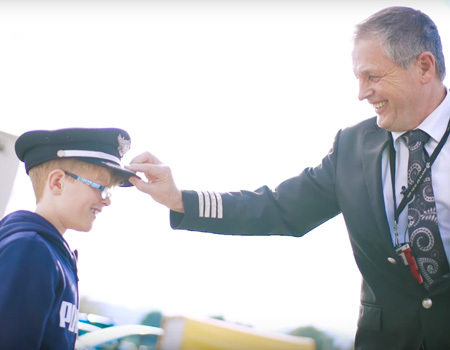 Forget a remake of The Dam Busters Weta - here's a story worth making! RJ Dickie invented, patented and marketed the world’s first stamp vending machine. His machines were in use for 50 years, 18,000 were used in Britain, with countless thousands around the world….